In digital processing, all data passed in the process-control loop is encoded into a signal. Binary refers to a numbering system with a base of 2, that is, 0 and 1 are the only possible counting states. The electrical signals on a wire are represented either by a binary "0", denoted also by low (L) and corresponding in transistor-transistor logic (TTL) to about 0 volts, or a binary "1", denoted by high (H) and corresponding in TTL to about +5 volts. Thus, in TTL, electrical voltages are only 0 to 5 volts and hence cannot be an analog representation of the dynamic variable. The importance of the dynamic variable signifies as various encoding of the binary levels. The encoding itself is a correspondence between a set of binary numbers and the analog signal to be encoded. The set of binary numbers is commonly referred to as a word, which may contain many binary counts called bits. Let us consider the encoding between a 4-bit binary word and a decimal voltage signal. Such a coding can be simply the representation of numbers between the two systems, as shown in table. Thus, if we wished to encode a 5-volt signal, where each bit corresponds to i volt, we would represent this in a 4-bit binary words as "0101". The encoding of a signal into a binary word implies that a sequence of 0 and 1 levels corresponds to the value of the signal. There are two methods by which a digitally encoded signal can be transmitted through the process-control loop. One method referred to as the parallel transmission mode, provides a separate wire for each binary number in the word. Thus, a 4-bit word requires 4 wires, an 8-bit wires, and so on. The alternate method is serial transmission mode of binary numbers over a single wire, where the binary levels are provided in a time sequence over the wire. These two methods are illustrated in figure for the digital encoding of the 5-volt level. In the parallel mode, the levels can remain set for any time on the lines, but in the serial mode, the levels appear only as a pulse train and must be interpreted in turn as they appear, introducing timing requirements. 10 volts/15 = 0.666 volts/state or volts/bit. In figure, Digital information may be transmitted on Parallel Lines, One for each bit, or erially, where the information appears on a single line in a time sequence. If more voltage resolution is necessary, we may use a word with more bits. A 6-bit word would have 63 span and 10 volts/15 = 0.159 volts/bit. 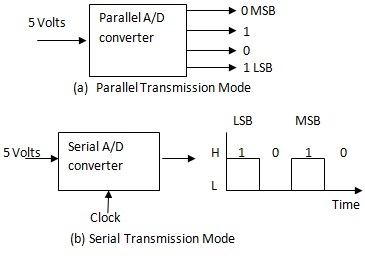 The digital-to-analog converter (DAC) provides the reverse action of converting the digitally encoded word into an appropriate analog output; that is, it decodes. Here again, each bit, by design, will correspond to a certain level of output, and thus the resolution, or the smallest increment, is the level of one state change. The example of ADC from voltage is only one example of the type of analog signal that can be used. Other converters may use analog signals of frequency variation, current, or even resistance as the primary analog signal. There are two approaches to digital processing in industrial-control situations. One involves using digital logic circuits or computers to supervise analog process-control loops and the other digital control of a dynamic variable.